The system which comprises all glands of the body is called glandular system. Glandular system is divided into two categories according to their secretion. The glands that secrete hormones are categorized as endocrine glands and glands that secrete digestive enzymes are grouped as exocrine glands. Those organs that produce enzymes or hormones and plays important role in the metabolism of the body are called glands. Exocrine glands: Those glands that have their own duct to pass their secretion are called exocrine gland. Their production is called enzyme. They help in the digestion. Endocrine: those ductless glands whose secretion directly mixed with blood and reach up to the target organs are called endocrine glands. Their secretions are called hormones and they maintain the overall metabolism of the body. The secretion of the hormones is regulated by the negative feedback mechanism. It is basically a system that if the hormonal concentrations in blood increase then secretion of the hormone is decreased. Heterocrinegland: Those glands which produce both enzymes and hormones are called heterocrine glands. Pancreas is a heterocrine gland. It produces hormones (Insulin and Glucagon) and enzymes (Trypsin, Amylase). They are ducted glands. They are ductless glands. They secrete mucus, saliva tear etc. like juices. They secrete hormones. Consumption of their product is more in amount. Consumption of their secretion is less in amount. Their secretions are related with respiration, digestion etc. like life processes. Their secretions are responsible for control and coordination of growth. Distance between the glands and the working region of the juices is less. Distance and the working region is less. Exocrine glands are studied in the digestive system. We will study about endocrine glands here. 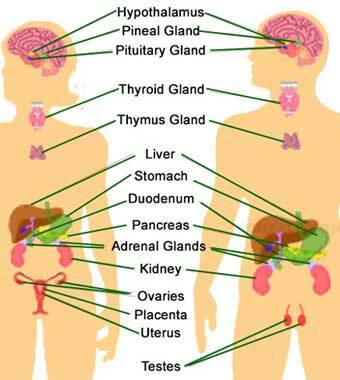 The science that studies about endocrine glands is called Endocrinology. The system which comprises all glands of the body is called glandular system. Those organs that produce enzymes or hormones and plays important role in the metabolism of a body are called glands. The types of glands are Exocrine glands, Endocrine and Heterocrine gland. Why is hormone known as chemical messenger? Hormone regulates the cells and other glands for the various activities of the body. Therefore, hormone is known as chemical messenger. Why is pancreas considered both as exocrine gland and endocrine gland? Pancreas secrets pancreatic juice that passes to the small intestine and helps in digestion as the juice contains enzymes. Pancreas also secrets insulin and glucagon directly into the blood to control blood sugar level. As the same gland secrets both enzymes and hormones, it is considered both as exocrine gland and endocrine gland. What are the differences between exocrine glands and endocrine glands? They give out the secretion into the ducts. They are closer to the target cells. Their secretions remain inside duct and reach the target cells directly. Their secretions are called enzymes. They do not bear ducts. They give out the secretion directly into the blood. They may be far from the target cells. Their secretions pass to all parts of the body but show effect on the target cells only. Their secretions are called hormones. The glands that can produce hormones and enzymes are called heterocrine glands. Pancreas is an example of heterocrine gland. Which type of gland is pituitary gland? The pituitary gland is a type of endocrine gland. It is popularly called the master gland. It produces growth and catalytic hormones which are poured directly into the blood. Which one of the following is ductless gland? How many categories Glandular system is divided into? Along with the nervous system, the ______ system coordinates the various activities of body parts. The endocrine system is _______ than nervous system. What is the cause of cretinism? Any Questions on 'Glandular System '?